At Xcel Cooling Products, we are a warehouse distributor of OEM and aftermarket automotive cooling products with locations in Carrollton and Dallas. •	Condensers: Condensers work by changing refrigerant into gas and releasing it into the atmosphere. Without a condenser, it would be impossible to cool a vehicle on a hot summer’s day, and here in Carrollton, summer is always just around the corner. If you are looking for condensers for your shop, you may have turned to the Internet. But do you really know who you are buying from and what you’re getting? If you are looking to purchase automotive cooling products, it pays to go with an experienced and reliable wholesale distributor, like Xcel Cooling Products. All of our automotive condensers are quality and come with a lifetime warranty. 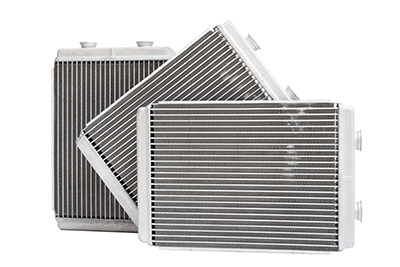 •	Radiators: A radiator is crucial component in a vehicles cooling system. It is responsible for removing heat from an engine to prevent it from overheating. At Xcel Cooling Products, we carry a wide range of radiators, from OE fit to high-performance radiators from top manufactures, and we’ll be by your side to help you find exactly what you’re looking for. In the rare event your radiator fails due to a manufacturer defect, we will happily replace it. Should you purchase the wrong radiator, simply bring in the undamaged part with the receipt and we will refund it. As a locally owned and family operated business, our reputation means everything to us. •	Cooling Fans: Cooling fans also help to prevent an engine from overheating by allowing the engine to maintain a constant temperature. At Xcel Cooling Products, we have supplied cooling fans to Auto body shops, body shop suppliers, and part stores in the Carrollton area since 2009. With a combined 50+ years of industry-related experience, you can count on us to meet your automotive cooling needs. Your satisfaction is our top priority, and we go the extra mile to make sure your expectations are met. If you are in the Carrollton area and have questions about our products or local delivery services, we invite you to give us a call. We are more than happy to provide you with a quote! We offer some of the most competitive pricing in the market!